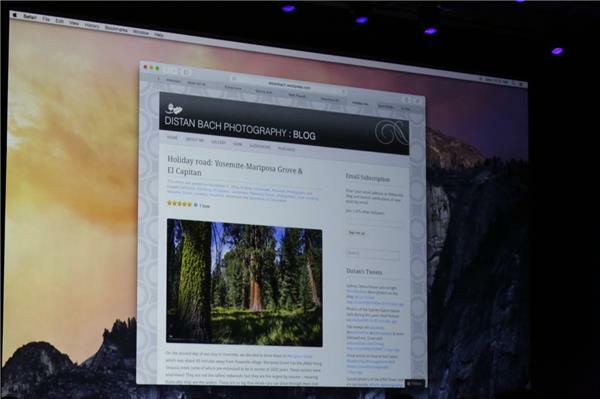 Kroll: Sharing couldn't be easier in Safari. Click share button here and can use new recent recipients button to address it to Craig. With one click, I'm ready to send that image. pages so I never have more than five or six in a browser window. Kroll: Before I send it, I'm able to add my two cents. Feature called markup. can edit the image without ever leaving Mail. Kroll: Mark-up is smart enough to recognize this and add an arrow. Really easy to add a comment. Annotating photos in an email, etc. thanks to markup. Clever, useful. Kroll: Can create a cartoon bubble, and markup replaces it with an official one. So can add a caption. Kroll wraps up his demo. And Federighi is back up. With apologies to the one guy on twitter who thought I was making too many Windows comparisons, this reminds me of what MS was pitching with clipping into OneNote, although I find OneNote frankly incomprehensible to use. Federighi: Next, something entirely different. It's called Continuity. At Apple, we believe you should use the right device for the moment. iPhone on the go. iPad kicked back on couch. Mac when working. But want transitiion b/t them to be as easy as possible. 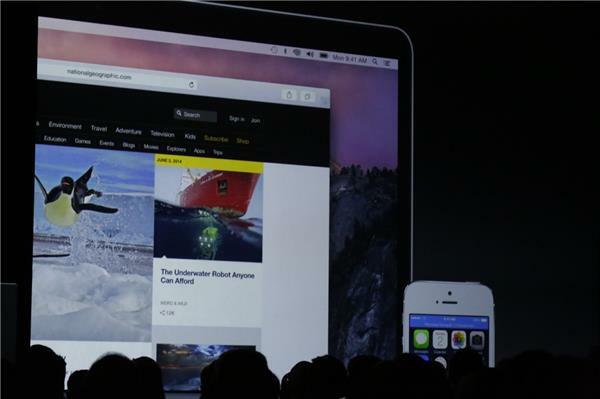 Federighi: Now we take it to the next level. It's called Hand Off. 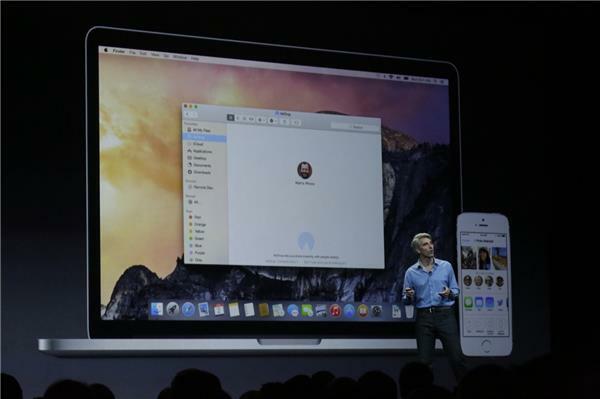 Federighi: When you're working on your Mac, the devices in proximity are aware of each other. If want to pick up iPad, swipe up on screen and can pick up what working on. Federighi: Works in other direction. Say composing email on phone and you walk up to your Mac. 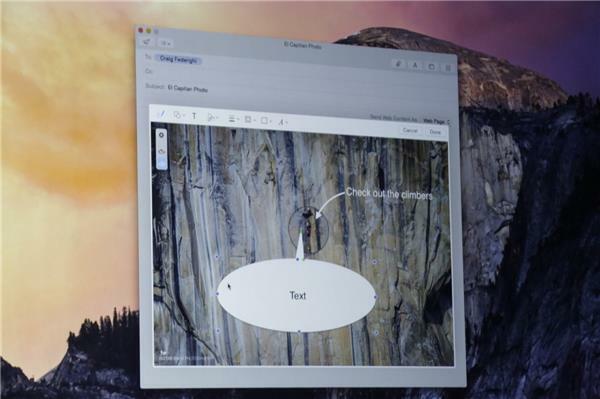 Mac will notice what doing, will prompt right on dock, and you can pick up and finish writing that message. 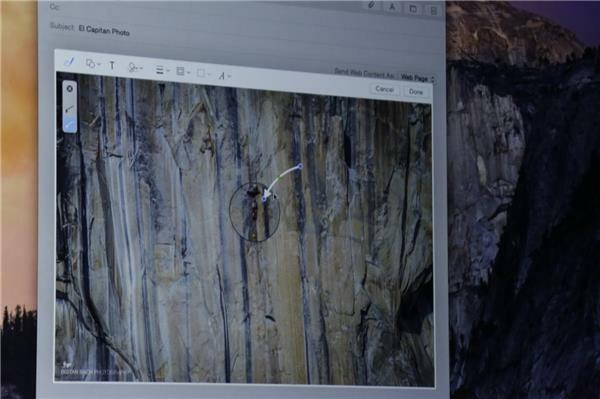 The threads linking OS X and iOS get even deeper and more intuitive. Great way to get you locked into the Apple ecosystem for computer, tablet, phone. 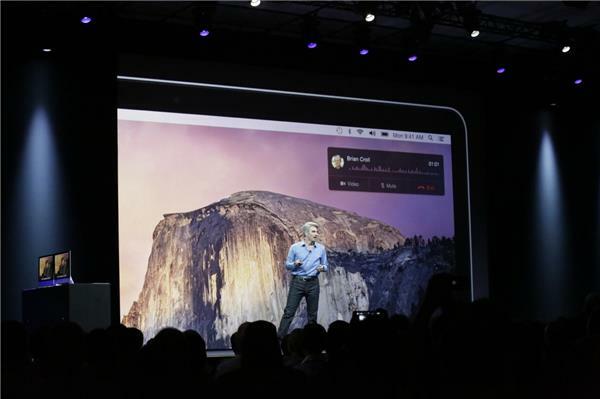 Federighi: Works even if phone is across room, sitting in a handbag. 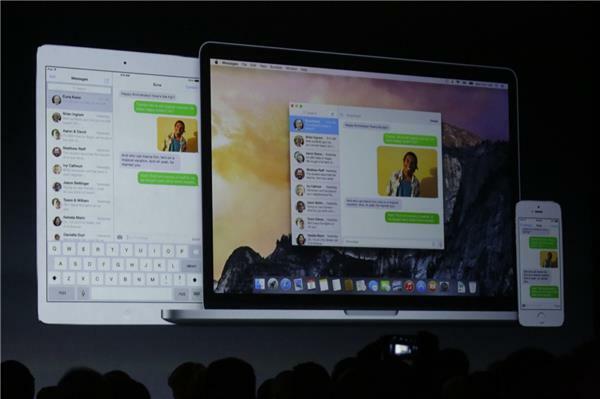 Federighi: Next thing wanted to handle was SMS. We all love iMessage. But then we have these green bubble friends. They have inferior devices and they insist on sending us message. Those messages don't show up on our other devices. Until now. 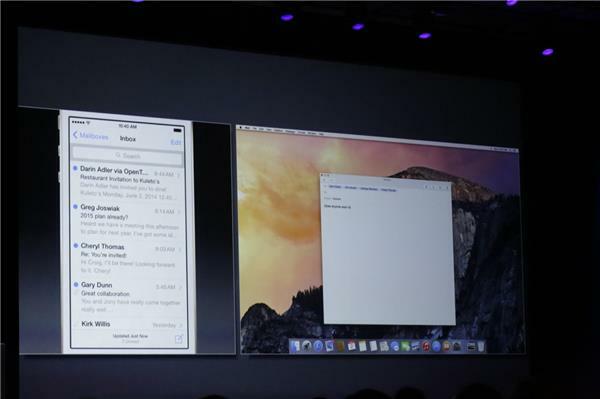 Federighi: Phone works as relay to automatically and transparently send messages between devices. Federighi: Able to do the same thing with phone calls. 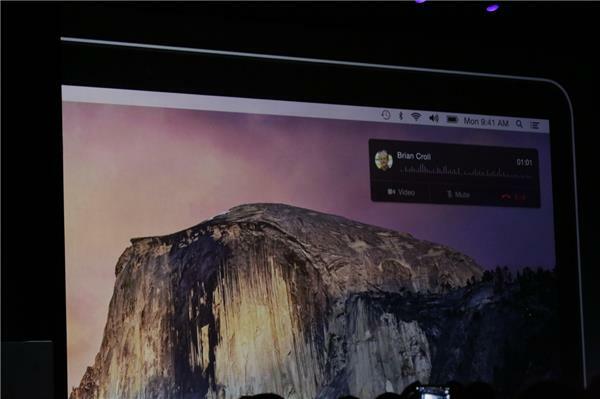 Now your Mac gives you caller ID. You can accept the call and use your Mac as a speaker phone. 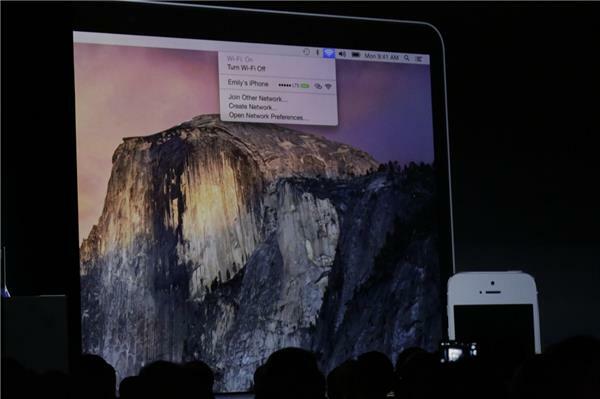 Big applause for connecting phone calls to OS X and iOS devices. Call a phone number on a webpage from your Mac, essentially by tethering to your iPhone's phone service. 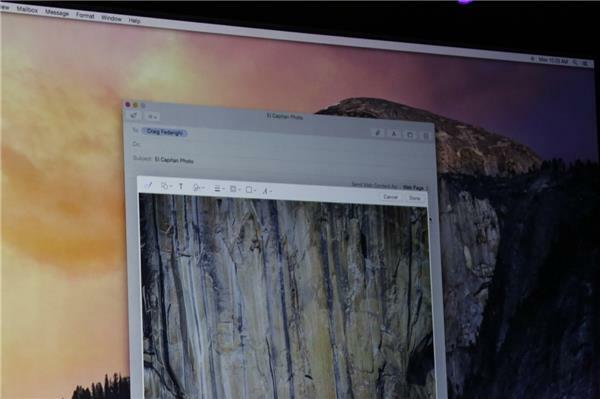 Federighi: Let's check out Continuity. We're going to start with Hand Off. I'm going to pick up iPhone. I was composing an email about karaoke night. My Mac was aware I was using my phone. Federighi: If I want to show this page, maybe pick up my iPad. There at the bottom is Safari. I just flick up, and it takes me right to where I left off. It's amazing. 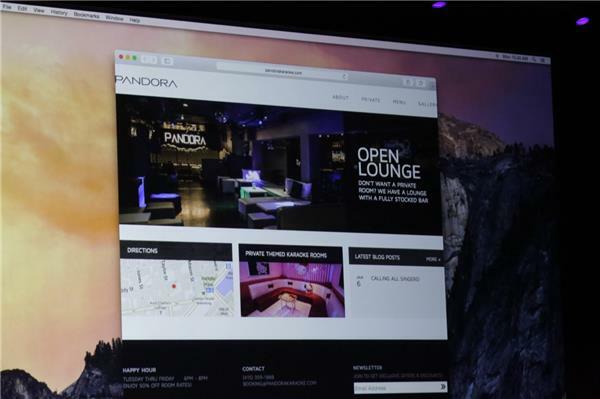 Quick -- is Pandora a real karaoke place? 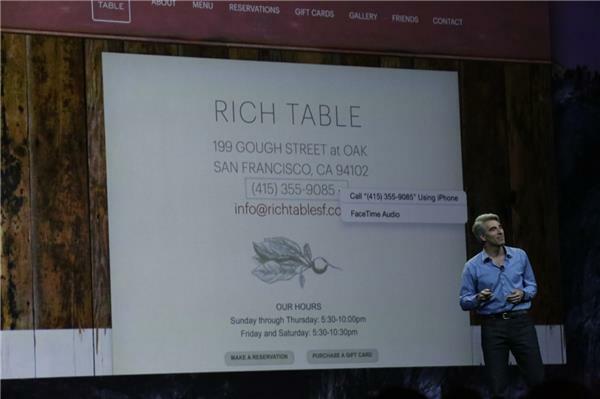 Federighi: Next up, phone calling. This is from my mom. Federighi: He turns away his mom's call, to disappointment of the crowd. haha. "This is my space." Are going to be asking everyone to mute their laptops all the time now so we don't hear phones ringing all the time? 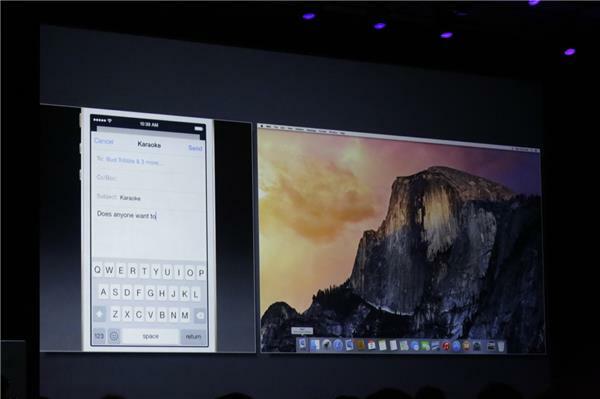 Federighi: Can dial a phone number from web page. 42 minutes in before we get the Dre cameo. Is it phone only? Or is he backstage? Dr. Dre's on the phone. 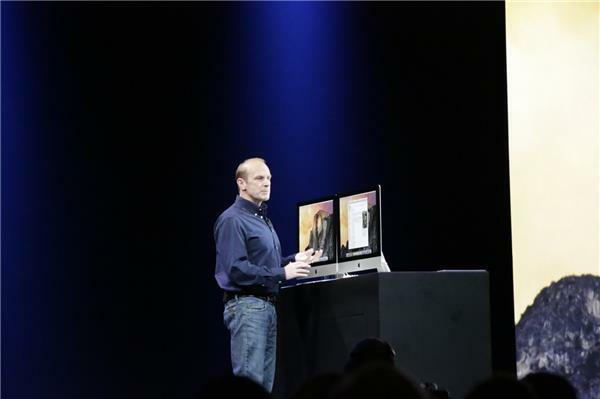 Federighi talking through Mac. Federighi says over 6,000 amazing developers at WWDC want to welcome Dre to Apple.